Powerful options trade assessment made simple. The VectorVest Options Analyzer has an intuitive, easy-to-use interface. Create a simple option position based on current stock information and option expiration date, construct your own composite option trades, or use one of the built-in trades. The Options Analyzer offers 10 different analysis graphs to show you how changing a stock’s price and time to expiration affects your option position. You can also use the Price Probability Analyzer to evaluate the theoretical probability of the stock’s price performance. The VectorVest Options Analyzer accesses the VectorVest database and allows you to verify and examine the Profit/Loss implications at expiration of options trades. It also allows you to perform sensitivity studies of all the factors affecting the option premiums prior to expiration. It is perfect for back-testing ideas and for assessing potential option trades. Available for a one-time fee of $495. Analysis – The Analysis Chart is a graphical representation of the potential outcomes of an option strategy. Probability – Using the Probability Chart, you can see the theoretical probability of a stock’s price based on its price volatility and time to option expiration. Time Decay – Using the Time Decay chart, you can view the option time decay based on time to expiration and stock price volatility. Trade Simulation – The Trade Simulation Chart allows you to view the performance of actual option positions with the passage of time. Volatility – The Volatility Chart allows you to view a graphical representation of the historical volatility of the security. Delta, Gamma, Theta, Vega, and Rho – These charts allow you to view a graphical representation of the “Greeks” – the basic analyses of option pricing. You can maximize profits and minimize downside risk using options by constructing composite option trades. The Options Analyzer provides over 30 different sample trades that are used by the best option traders. 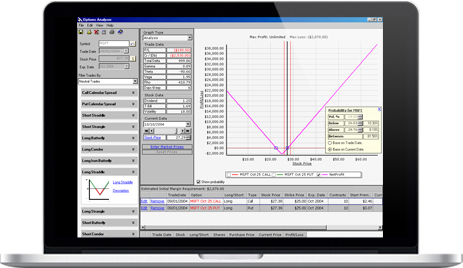 The Options Analyzer includes the Price Probability Analyzer. Based on historical price volatility, option expiration and current stock price, the Options Analyzer will calculate a theoretical probability that a stock’s price will be above, below, or between two variable price points that you define. Using the Price Probability Analyzer, you can determine whether or not the chances are good that you are going to make money, lose money, or break even on an option trade.